Focusing on student success and helping students grow so they can help transform communities were themes of the latest strategic planning community dialogue session. During the Feb. 19 dialogue session, 20 faculty, staff, alumni, students and community members gathered in small groups for an intimate conversation. Participants shared stories exemplifying peak moments of success they or others experienced at Wright State. Participants said the dialogue session made them feel hopeful about Wright State’s future. 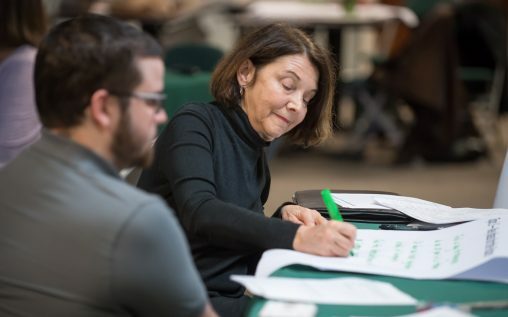 Carmen Culotta, an instructor in the Department of Psychology, said the discussion left her feeling optimistic that the Wright State community can make a difference in the lives of students. “Whether we’re alumni, staff, faculty, we all share the same vision for Wright State — that we’re all invested in the future of our students, and that we really should be focused on efforts we can engage in that would increase graduation rates, increase student satisfaction and make students proud to be part of Wright State,” she said. Marietta Orlowski, associate professor in the Master of Public Health Program, said her dialogue group came from different areas of the university but all shared stories revolving around student success and student opportunity. “Those are really our points of pride,” she said. “It created a lot of hope, that there’s a lot of good talent, that there’s a lot of good resources and there’s shared values that can really propel us into the future,” Orlowski said. Brian Jarvis, who has three degrees from Wright State, said he was proud that he was fully prepared for his first job after graduating in 1982 with a degree in computer science. 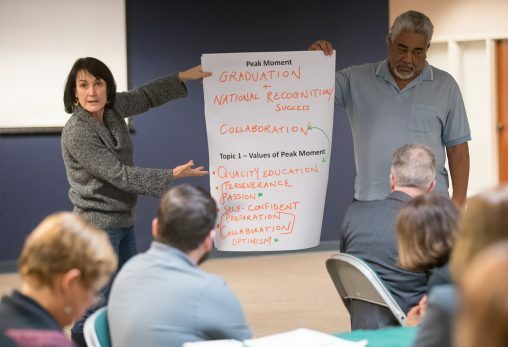 The community dialogue session will help refine the university’s vision, mission and values statements as part of the ongoing strategic planning process, The Wright Path to 2025: Pride, Transformation, Potential. The strategic planning process also includes the creation of a new plan aligned with university resources and metrics that can measure the outcomes of those strategies. The plan will guide decisions at the university on a day-to-day basis. The dialogue sessions are open to students, faculty, staff, alumni and community partners. Jennifer Attenweiler, associate director for residence life, said the dialogue process allowed her to talk openly and honestly in a small group. President Cheryl B. Schrader said the planning process will continue after the strategic plan is complete and it will regularly be revisited and adjusted based on the community’s continuous input. The strategic planning process is intended to start an ongoing dialogue among the campus community that encourages continuous reflection and revision of the community’s hopes and priorities. The conversations are a chance for community members to engage with others across the university in meaningful ways. “The process that we’re undertaking over the next nine months is just as important as the results,” Schrader said. Participants of the Feb. 19 dialogue session said they valued the opportunity to talk with and hear from people from other parts of the Wright State community. “I felt like I could talk openly and honestly in a small group. I felt comfortable and trusted to give my valuable input,” said Jennifer Attenweiler, associate director for residence life. “I can’t help but be impressed by the way people are engaging in this process and how that will take us to the next level as long as we work together,” Culotta said. Many participants said they were impressed that many community members shared the same values or stories of success. Noeleen McIlvenna, professor of history, said she was fascinated that four of the five people in her discussion group shared stories about graduation. The strategic plan will guide Wright State by creating a vision and focus that directly aligns resources with the community’s values, strengths, and the strategy built around them. 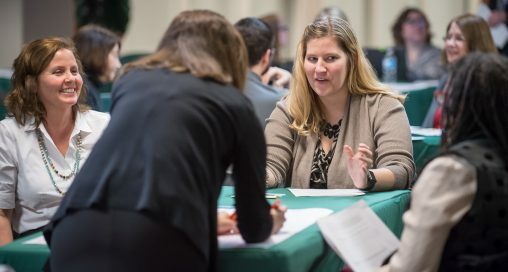 The planning process will be continuous and will put Wright State in a position to thrive in higher education’s changing environment, help the university achieve financial sustainability, and foster a campus atmosphere that provides graduates with opportunities to excel in fields that define the future. Monica Snow, interim executive director of the Office of Marketing, recorded stories members of her group shared exemplifying moments of success they experienced at Wright State. The first phase of the planning process is focused on gathering community input to develop an updated vision, mission and values statement for Wright State. The statement should reflect a compelling perspective about the core identity of Wright State and its future.